Coleraine have reacted to their injury crisis by signing ex-Kilmarnock player Martin Smith on a short-term contract. Smith, 22, was on the books of hometown club Sunderland before having spells with Gateshead and Carlisle United. He moved to Kilmarnock for the 2016-17 season and played 12 games for the Scottish club. "It was important to get a stop gap with real ability and Martin will provide that," said Bannsiders boss Oran Kearney. 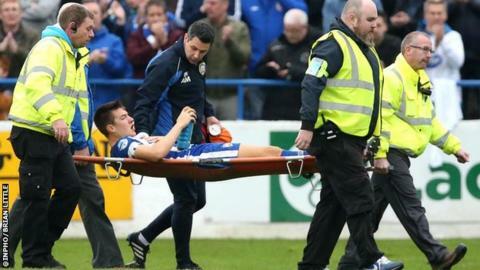 Coleraine's latest injury blows came earlier this week when Eoin Bradley and Brad Lyons were both ruled out for two months. Lyndon Kane and James McLaughlin are also suffering from long-term injuries. "We have a squad of 21 players but we have four long-term absentees and David Kee is only back and needs more minutes. "Martin has good traits and will fit in well with our squad. "He will need international clearance, so will likely miss out on Saturday. However, we hope to get him 90 minutes on Tuesday night against Institute."